This week I was having coffee with a local African-American pastor, a man that I hope is becoming a friend as much as he is a colleague. He was recalling an opportunity he had earlier this week to serve on a panel discussion on race where he was asked the question, “How do you feel about confederate statues coming down?” His response was, “I’m excited, because Christianity is all about taking down statues.” When he recounted that answer, it took me aback. Really? He was excited about the possibility? Before I go any further, let me tell you my background. I’m a son of the South, having lived in North Carolina my whole life. My great, great grandfather fought under Robert E. Lee in the Siege of Petersburg (1864) in what we jokingly called “The War of Northern Aggression”. I’m a walking billboard for white privilege. I attended UNC-Chapel Hill and remember fondly my frequent walks to Franklin Street while passing by the Confederate memorial known as Silent Sam. I graduated with a B.A. in History, concentrating on American History. So I would like to think I have a deep appreciation for preserving American history. I went to Reformed Theological Seminary, which is a conservative seminary started in Jackson, Mississippi. Every year a Presbyterian pastor would invite seminary students to join him on a tour of Confederate battle sights while he talked about the religious faith and character of men like Lee, Jackson, etc. For the past 14 years, I’ve been a pastor within a conservative and predominantly white denomination. I love my denomination because of its commitment to the inerrancy of Scriptures and church planting, but having started in Birmingham in the 1970’s, there is a racially-charged past that we are having to address within our own ranks (and I am really thankful for how we are addressing it). I’ve heard most of the reasons why we shouldn’t take down memorials to some of the Confederate heroes. They suggest we can’t erase our history. Congressman Allen West said, “History is not there for us to love or hate, but for us to learn from and seek to not repeat its mistakes.” They suggest that there is a slippery slope if we start taking down statues. If we take down Robert E. Lee, what keeps us from taking down the statues of other slave holders like George Washington or Thomas Jefferson? The only person who would qualify for a statue in his honor would be God. As a pastor, I can’t even encourage that because of the 2nd commandment. I’ll admit that it is difficult to know where to draw the line, but it doesn’t change the fact that lines need to be drawn, and sometimes those lines need to be redrawn. Whereas George Washington’s legacy is tied to much bigger realities like the founding of our nation, Robert E. Lee’s legacy is tied to his military expertise in fighting for states rights to own slaves. The issue driving the question regarding monuments is what will we as a nation celebrate? Of all the moments in our collective history, which ones deserve memorializing as a reflection of our proudest moments as a nation? Not every person and event can be memorialized equally. It isn’t about erasing history. I’m confident that my African-American brothers and sisters don’t want to forget the history of their ancestors. It’s about choosing the proper contexts in which said history is to be presented. Some monuments belong in the public square, and some belong in museums where their stories can be told in the context of a bigger narrative that can promote healing for our nation. In defense of keeping the confederate statues, Allen West has said, “If there are those who truly believe we protect ourselves by trying to revise history due to false emotions, then we miss out on who we are as a nation, and our evolution. The statues of long since deceased leaders of the Confederate Army do not stand to remind anyone of oppression. And if a statue can oppress you, then I submit that you have greater issues.” He seems to be suggesting that statues aren’t really that big of a deal. Get over it folks. Statues can’t oppress you. 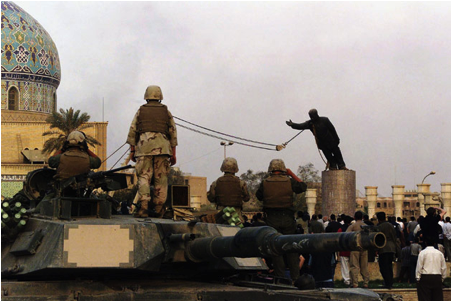 If that is true, then why did we as a country feel compelled to take down a statue of Saddam Hussein in such a dramatic fashion and then publicize it all over the world? And why did Saddam Hussein have images and statues of himself all over Iraq to begin with, if not for the purpose of reinforcing his oppressive regime? If you know your biblical history, do you not remember what happened at the foot of Mount Sinai when God’s people made a golden calf (Exodus 32)? God seemed to think that certain statues can absolutely oppress us. Statues can be both a reflection of our heart and they can shape our hearts in good or bad ways. The point is that statues matter greatly. They can heal and they can hurt. When I was in seminary, I remember hearing the story of Saint Boniface, who lived in the 7th century. Boniface was a missionary to Germany. The story goes that he traveled to the German village of Hesse where he came upon a sacred oak tree that was dedicated to the pagan thunder-god known as Thor. Supposedly, there was a community of heathens who went so far as to make a human sacrifice (typically a child) at the base of this sacred oak in honor to Thor every winter. The next part of the story is somewhere between truth and legend, but upon reaching this village on Christmas Eve, Boniface approached a crowd of pagans who had surrounded the base of the Thunder Oak and said to the group, “Here is the Thunder Oak, and here the cross of Christ shall break the hammer of the false god, Thor”. And Boniface picked up an axe and proceeded to chop down that tree to the horror of the villagers. Dare I say that Boniface was excited to tear down this statue which symbolized a very dysfunctional history. When the people realized that Thor did not strike Boniface dead, everything changed. Known as “The Apostle of Germany”, his actions became the spark that ignited the christianization of the country of Germany. Tearing down an idol can be a beautiful thing. The point is that when particular statues symbolize the mistreatment of individuals, a Christian should take comfort when they are taken down. When a statue represents something that strikes at the core of the gospel, a Christian should be at peace when it is taken down. When a statue symbolizes the division between people for which the cross says there is to be unity, a Christian should be thankful when it is taken down. If you looked at a timeline of when Civil War monuments were erected (there are likely over 700 of them), did you know that there was a spike at 2 particular times in U.S. History? The 2nd largest spike was around 1960. Do you know what took place around that time? The famous court case Brown vs. the Board of Education (1954) which led to desegregation. Those statues were not erected to celebrate military heroes. They were erected 100 years after the war ended as a power play and a tip of the hat to white supremacy, to say “You may have won the court case, but we are still the ones in power”. The largest spike in monument erections took place in the early 1900s. Guess what took place at that time? The famous court case Plessy vs. Ferguson, which was later overturned by Brown vs. Board.Yet again these statues were erected at a time when African-Americans were fighting for their rights. These statues were racially motivated. It wasn’t about respecting the confederate dead. It was about white supremacy. When I read those words, I was floored. It completely changed my perspective on a statue that had heretofore brought back memories of my days throwing frisbee in the quad. I had no clue that the original intention of that statue was far more sinister than I could have ever fathomed. 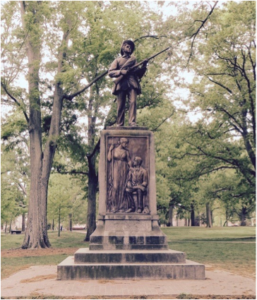 It made me think…why in the world would I resist those who would want to take it and other statues down? Why would I value Confederate dead more than the living brothers and sisters in Christ who know the intention behind many of these monuments? To fight for these statues to remain standing is like encouraging the Apostle Peter to resist accepting his fellow Christian brothers who were not of the same race. That actually happened, and the Apostle Paul called him out on it in Galatians 2:14, “And the rest of the Jews acted hypocritically along with him, so that even Barnabas was led astray by their hypocrisy. But when I saw that their conduct was not in step with the truth of the gospel, I said to Cephas before them all, “If you, though a Jew, live like a Gentile and not like a Jew, how can you force the Gentiles to live like Jews?” Paul’s point is that the issue of race is a gospel issue. It strikes at the core of whether we believe the gospel truly has broken down the dividing wall of hostility. The cross should shape every aspect our life, including who we eat with and how we speak of our history. More importantly, as a Christian, I should always be willing to let go of possessions, even treasured ones, when it serves as an opportunity to show the power and preeminence of the gospel over everything else. Why should I cling so tightly to any material possession, whether it be a statue, a house, a car, or even my own children? I would be excited to see white Christians who are willing to humble themselves in deference to those who have been oppressed historically. I love the idea of people going out of their way to live out the words of Jesus, “He has sent me to proclaim liberty to the captives to set at liberty those who are oppressed”. There is something powerful at work when the gospel gives us the ability to lay an axe to symbols that even have historical significance for our our heritage. There is also a measure of sadness, because in my case, it took me too long to dig into the history of our past to see the truth behind many of these monuments. I have often taken for granted the privileges I have been given simply because of the color of my skin. I am sad that my African-American brothers and sisters have been saying we have a race problem, but I have often given lip service to it. But I’m thankful for colleagues and new friends who are gracious to sit with me over a cup of coffee that I might start being part of the solution, and no longer the problem.